We are very sad to announce the death of our colleague, Professor Richard Norton, on February 20, 2019. Norton’s research experience in the Middle East spanned nearly three decades, including residences in Bahrain, Egypt, Jordan, Kuwait, and Lebanon. His recent research interests include inter-sectarian relations in the Middle East, reformist Muslim thought, and strategies of political reform and opposition in authoritarian states. In the 1990s he headed a widely-cited three-year project funded by the Ford Foundation that examined the state-society relations in the Middle East and the question of civil society in the region. It is indicative of his interests that many of his courses were often cross-listed with the departments of international relations and political science. He has also held academic appointments at New York University and the United States Military Academy. 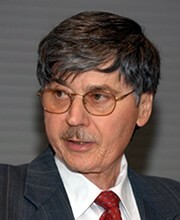 In 2006 he was an advisor to the Iraq Study Group (Baker-Hamilton Commission). He was also Visiting Professor in the Politics of the Middle East at the University of Oxford and a Fellow at the Oxford Centre for Islamic Studies. Some memories from within the Department of Anthropology, and from colleagues and friends.